Takeshi's small nuaces may be lost on the small screen, leaving little more than violence and gang sterotypes. Japan's king of the artistically extra-violent yakuza flick, Takeshi Kitano (aka "Beat" Takeshi), makes his English language debut in "Brother," a heavy, moody L.A. gangland drama that has all the bloody shootouts the writer-director-actor is known for, but loses its grip as it tries to grab for an emotional hook. Kitano stars as a hunted Tokyo mob enforcer who escapes to Los Angeles after a turf war that left his clan decimated and his own brother acquiescing to the enemy. He muscles in on the operation of another, younger half-brother (Claude Maki) who is scraping by as a petty thug, and quickly organizes the brother's shabby crew into a merciless force poised to take over the local territories of both street and Mafia gangs. There's a vicious circle, rise-and-fall element to Kitano's story in "Brother," as he rapidly builds a minor empire with his brother and another fiercely distrusting lieutenant, played by Omar Epps ("In Too Deep," "Love and Basketball") at his side. Just the gang's move from a small room in the back of a warehouse to a swanky office in a converted gymnasium (complete with leather couches, a redwood conference table and an accountant) should be enough to signal impending and violent storm clouds on the horizon in the minds of savvy moviegoers. 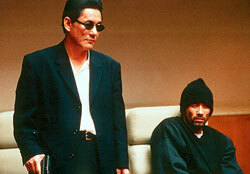 As writer and director, Kitano attempts to build a brotherhood between these younger men and their mentor, focusing on Epps who slowly comes to trust and even joke with Kitano's character as they murder their way though L.A.'s seedy underworld. But while he drapes the movie in a dense psychological timbre, these sensibilities come off rather hollow due to the film's vague -- albeit intense -- performances. Kitano's quiet, practiced menace gives "Brother" a distinctively ponderous atmosphere that's a far cry from American shoot-em-up movies. This is a guy who can get away with wearing sunglasses through an entire movie and hardly uttering a word. But what drives the character remains a mystery. He's just a generic Kitano tough. Epps lends credence to his turn as a boy from the 'hood, but that's about as deep as his character gets. There's an awkwardness to much of the acting that I can only assume arose from the language barrier between director and actors. Kitano doesn't speak much English and I suspect he had trouble recognizing what sounded unnatural when it came to the delivery of dialogue. Kitano does not make mindless action movies, but he does frequently get carried away with the gooey head wounds, the severed digits (there's three or four of those), the endless rounds of ammo resulting in hemorrhaging, Swiss-cheesed bodies, and the chopsticks-up-the-nose resulting in blood splattered onto the screen. The man is capable of truly elegant violence, as in an early scene in which a huge shootout is depicted only with sound and muzzle flashes reflected on a dead body (the first person shot in the melee) slumped in a car. But the times he chooses to imply violence -- as opposed to just drenching the screen with blood -- seem to be random and far between. Another scene late in the movie takes the same sort of suggestive approach until Kitano unnecessarily rewinds to show the gunfire all over again in explicitly bloody detail from another angle. Strangely, this episode leads directly into a jarringly over-acted, over-emotional finale that veers "Brother" so far off course you'd think the picture had blown a tire. Even Kitano's most violent films have an veritable emotional element to them. But this time he seems to want to pack it all into the last scene, which feels dishonest in the wake of the rest of the movie.